I was very fortunate to get any sort of image for this week's post, and was even more fortunate to find such a cute spider willing to pose for me! I spent most of Sunday morning out in the garden, searching for subjects - and finding plenty. So, what was the problem? Unfortunately it was blowing a gale! Every bee, bug, hoverfly, fly, butterfly, moth, beetle and arachnid I found seemed to be clinging onto a flower, or leaf for dear life! Everything was swaying about so much it was impossible to focus on. This didn't stop me from trying, but only led to quite a few disappointing blurry images. 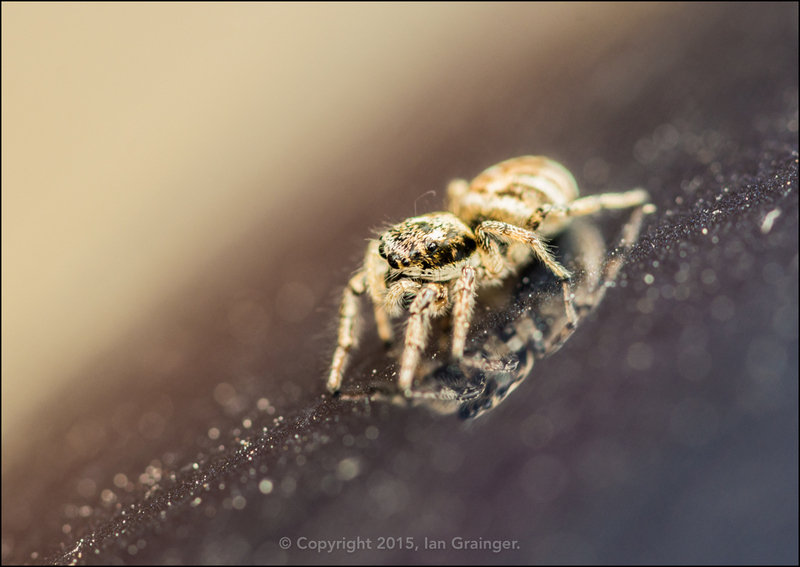 Therefore, I was very pleased to see this little Salty (Salticus scenicus) exploring the bonnet of my car! I managed to follow him from the passenger side to the driver side where he stopped and started posing for me. He was even thoughtful enough to pose in a place where I could also capture his reflection.